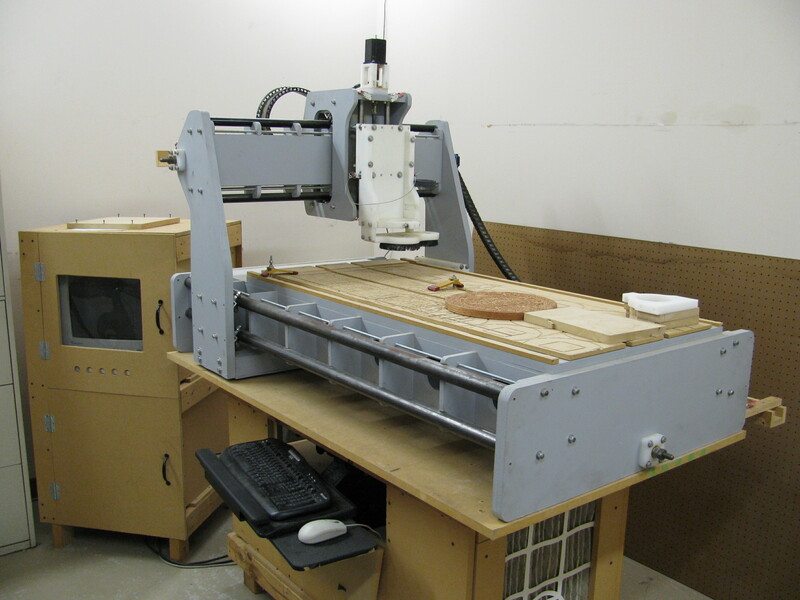 I managed to acquire a used homebrew joe's 2006-R1 CNC mill on Craigslist last week and with a little help from CCCKC members I got it set up at the hackerspace! It didn't come with a spindle, but I also found a variable speed 2HP Craftsman router with 1/4" and 1/2" collets for a reasonable price as well to use with the setup. Unfortunately, it turned out to be too big for the spindle mounts so we cut some temporary mounting brackets out of MDF to mount the spindle and use it to cut new mounting brackets. I'm currently waiting on some 3/4" HDPE and endmill bits to come in so we can start cutting while I debug a couple issues the setup seems to have with limit triggering. As far as my projects go, access to a CNC setup should allow me to skip the bootstrap section of my CNC mill design. Hopefully CCCKC members will get some good use out of it as well! This entry was posted on Monday, January 18th, 2010 at 8:59 pm and is filed under News. You can follow any responses to this entry through the RSS 2.0 feed. You can leave a response, or trackback from your own site.